Intangibles Project » What’s Taking So Long? More and more folks have been asking why they don’t have the new Ages on the server to play already. I can understand the desire for new content but the thing to remember is we’re doing this in our spare time. Whilst the group has about twelve members at the moment only about 3 or 4 are actively working on intangible stuff. Two of those people actually working on content (myself and Chloe). Outside of work spare time is already limited, this is then eaten away further by errands, social obligations, family obligations and all the other little details that impact on life. Not only that but there is a ridiculous amount of work that goes into making Ages, after all you are in fact making a game (or at least parts of a game). Kadish Tolesa, took six months to build back in the day, and this was with Cyan at their height. Now whilst this post will certainly not do the process justice, I will try and attempt to walk through what goes into Age building and the approximate time it takes for everything. More often than not it starts with an idea. This idea gives rise (depending on artistic temperament) to concept art and mapping of the Age or area out. Now with Intangibles the artwork has already been done thus this phase is skipped. So on to building then. Now obviously the more simple the Age/area is the easier it is to build, unfortunately the majority of the items in the intangible projects are not simple both from an artistic point of view and from a technical point of view. Lets take a look at Rebek, and at the risk of potential spoilers, here is an overhead view taken in Blender (which is the 3D software I use to build Uru content). You see that tiny little white dot? That is Simon. Simon is a scale low-poly replica of the male avatar model from Uru. From that you can see just how big Rebek is in relation to the avatar model. This second image shows a portion of the land closer in view so that you can see some of the complexities of how the land is formed (cliffs, tunnels, and so forth). At this juncture, Rebek is pretty far along in terms of the base landmass. Now to build this from scratch you’d need a starting point. There are various ways to start building a simple cube, a simple sphere which is then broken up and the vertices moved around and duplicated until it begins to take form. With something like Rebek a grid layout would be the best bet. For those not familiar with building 3D stuff and perhaps not familiar with the terms I use let me present the following image which explains in a manner what vertices, edges and faces are. Now a grid is exactly what it says, it’s a grid with a default 32 squares by 32 squares (this value can be increased or decreased). From this grid you now have a “canvas” of sorts to start working on. A lot of modeling is pushing little vertices around bit by bit shaping them into what you want them to be. This by itself can be very time consuming. In this image you can see a series of interconnected tunnels, these tunnels (just to give you a sense) took me around 8 hours to make. Starting with the core shape, extruding it, resizing it, running it in the directions it needs to go. This was then followed by connecting it all up to each other and making sure its all level. Now at this point the base landmass of Rebek would have taken approximately two months to get it to where it currently is. Again, this is just the base of the Rebek landmass. Texturing it all well that can take a couple of days depending on circumstances. Some meshes when you UVmap them look fine from the get go, some don’t however (textures can get stretched, or show seams and so forth). If the meshes don’t look good when they’ve been UVmapped then you have to fine tune it all. Unwrapping bit of the land by bit and moving yet more vertices around until it looks ok. On complicated models this can take a long time, on the base of Rebek it was a lot easier. Then what happens? Well now the base of Rebek’s landmass is modeled and the base texture laid down we start looking to other aspects of the Age. One side of the Age is duplicated (just the ground) and split into it’s own mesh, this is then retextured with a grass texture. Of course we want the grass to blend in with the rock at its edges and not suddenly end which means we need to more to vertex painting. Vertex painting allows us to paint faces on a mesh to add colour or alpha transparency depending on the settings. So now we have to go around all the edges of the grass area, all the areas we want the rock to bleed through and paint it the black colour we have applied as an alpha value. Admittedly this doesn’t take too long, 30 minutes to an hour depending on the size of the area and how many faces needs alpha applied to it. This process is then repeated for secondary grass textures (to break up the textures and make things more lifelike and less repetitive) and to the base rock landmass of Rebek (some areas need more cracked rock, some smoother, some needs lava drip stone, and so forth). So perhaps another 30 minutes to an hour there as well. This of course is not taking into account the time it takes to search for photo references and to make new textures. When needed, the time allocated for which varies depending on the complexity of the texture and the mesh it’s being applied to. For example the new rock texture I made for Fahets took me about 10 minutes to make, the texture I made for the character of “Lore” took me 1 to 2 hours due to lots of fine tuning to get the texture looking right. What’s left to model now? Well there is all the trees, the grasses and bushes and litter the age, floating rocks, village, statues, cages, bridges, the list goes on. Grasses and bushes are easily made, you could spend 20 to 30 minutes making the various models for them and unless you have existing textures probably another 10 to 20 minutes to make textures for them. Then it’s simply a case of duplicating the meshes again, and again, and again, until you have enough grasses and bushes to cover the Age. With Rebek, that’s a lot..in fact I have to deactivate the “ground clutter” when working on the Age because it freezes Blender up. This process has to be done for each different plant life (there’s about 5 or 6 different types) plus any rocks/pebbles. 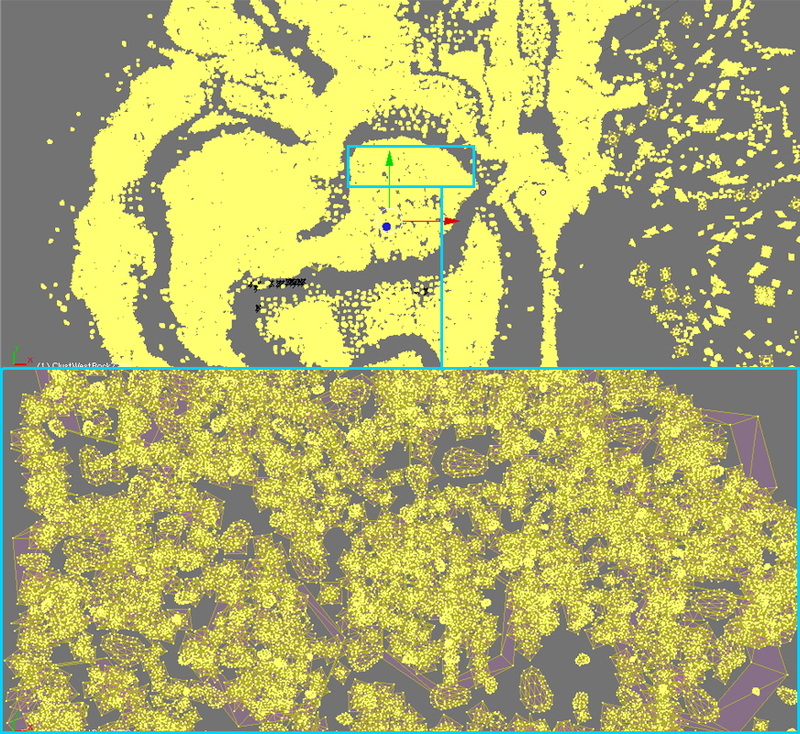 Another, all that yellow…those are selected vertices. The second shows a closer view of just a section of this “ground clutter”. That’s all simple stuff. The village requires building the huts, the rocks that surround it all the textures and carvings the natives to the Age made. Then all of that needs to be placed so that Avatars can navigate it (making sure something isn’t too far away to jump onto). You’re looking at a week or 2 at best to build that. The statues, they’re require modeling, positioning, new textures made for them. You’ll be looking at perhaps 2 to 3 days for that. The same again for the “goals” of the Age and probably the same for the cage area. The trees? Well they have to be modelled and textured..some could be duplicated but a lot would need to be unique models. Not only that but they need to be sized correctly to allow the avatar to navigate them. For this it would be likely a week maybe a week and a half of work. Now this is just modeling.. The cage and the means to get to it? Well that all needs to be animated so the players can interact with it. Establishing a base frame, tracking and locking the meshes across the frames making sure it is all timed correctly so that it produces a smooth animation, plus the scripting to go with it. Animation and global effects to the “goals” of the Age would need to follow a similar method. Any extra wildlife (animals for example) they’d need to be modeled, textured and animated and scripted also. Here is an example of some code for a somewhat complicated animation. In this example (from Nadnerb) it allows an avatar to press a button and unlock a door. The script covers the avatar’s movements, the button changing to reflect being activated, as well as the door unlocking and opening. Just to give an example of what kind of thing goes into animating an object. What’s next? Well the Age needs water…so wavesets needs to be implemented. Anyone who has experience Age building will know what a pain in the neck wavesets can be. For those of you who may not known what wavesets are, those bodies of rippling reflective water in Cyans Ages? Those are wavesets. If you’re curious what goes into getting wavesets working, I’d recommend looking at this post by Sirrus. All of this, thus far..is simple stuff. Rebek, like many other Ages in the Intangible projects, requires things that are currently not in the game. New avatar animations is probably the simplest issue of these. Players need to be able to interact with certain things in a manner that currently isn’t in game. So new avatar animations needs to be built for this…and these animations are a lot more complicated than animating a lift to go up and down. But wait…there’s more. In Rebek players need to be able to hunt and trap other players…this is a mechanism that isn’t in the game either. This doesn’t just mean new avatar animations it means new features being added to the games code itself. All this…this is just Rebek. Kalamee is just as big (possibly bigger I don’t recall) and requires elements like player inventory (which again, does not exist in the game and would need to be added) to proceed through the Age…amongst other features that needs to be added. There are roughly 10 Ages in the Intangibles project. Each needing similar amount of work listed above if not more. Some of these Ages are smallish, some are huge. Then there is the matter of each Age having sub Ages connected to it, or areas of D’ni that it Links too which also need to be built, textured and rigged. Now me typing about all this, doesn’t do it justice. You want to know how much work goes into building new Ages..I’d suggest going through the Guild of Writers Wiki page, browse the tutorials and perhaps try giving it ago yourself. There are about 2 or 3 of use actively building content for MOUL..Chloe..she can build and code..me? I can build, I can do a little scripting but I’m an artist not a coder. At the moment the majority of work is coming from us two. I have approximately 4 hours of free time from Monday to Friday (more on the weekend depending on what’s going on). That’s 4 hours to be divided between Intangibles, social and family commitments, personal projects, the gym, TV shows/movies, plus any other thing I’ve forgotten about. As for Chloe? I can’t speak for her, but I know her work schedule is very busy. I understand the desire for new content, but there is no time frame to this. I can’t give you an answer of whether it will be months or weeks. When it is ready, it’s ready.